This system was designed to be used to inspect and laser gage a wide variety of large molded, stamped, formed or machined parts. 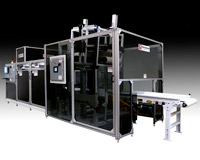 It included an in-feed conveyor with a custom designed part inverter and positioning system. A high resolution Cognex machine vision camera was programmed to verify correct part number and presence of certain features on each part. The camera also determined the final part position in x-y-theta. It sent these coordinates to a 3 axis Cartesian robot for further part gaging using an Omron precision line profiling laser. Measurement data was collected and entered into a formula to determine overall pass or fail of each part. Good parts were sent down one lane and bad parts down a different lane of the off load conveyor. All machine functions were controlled with an AB SLC-500 PLC and displayed on a color touch screen HMI. The large frames included Plexiglas and plastic cover panels, interlocked access doors, fork lift channels and multiple leveling pads.